You've probably sampled grilled calamari if you've ever been to Greece: this quick and easy appetizer is a perennial favorite there. Called kalamari tis skaras in Greek, it also works well as a main meal. Top it with plenty of freshly squeezed lemon juice and enjoy with a nice chilled glass of ouzo. Calamari is available for purchase at most fish or seafood stores, but this doesn't necessarily mean it's fresh-caught. Squid has almost invariably been frozen at some point, so there's not much difference between buying it frozen or "fresh." There's certainly no shame in using frozen calamari and thawing it. You can place the calamari slices directly on the grill, but placing them on skewers makes a nice presentation. Most fishmongers sell squid divided into two parts — the tentacles and the body. Slicing isn't mandatory. You can grill the bodies as is, but increase the cooking time just a bit. Take care not to overcook the calamari — it will become chewy. Ouzo is good and it's a Greek tradition, but it might not suit everyone's palates. Pairing the calamari with a crisp white wine works well, too. Serve the squid with a salad and crusty bread as a meal, or alone as an appetizer. You might also use it to stuff a pita along with a little of the salad. Clean the calamari if necessary. If you purchased it frozen and packaged, this might already have been done for you. Slice the calamari horizontally into ½-inch rings. Combine the olive oil, garlic, oregano, mint, lemon juice, salt and pepper in a large bowl. Add the calamari slices to the bowl and toss them to coat well. Cover the bowl with plastic wrap and refrigerate for about 30 minutes — you can heat the grill while you're waiting. Drain the calamari in a colander, then lift each piece out separately to allow any remaining liquid to drip off. 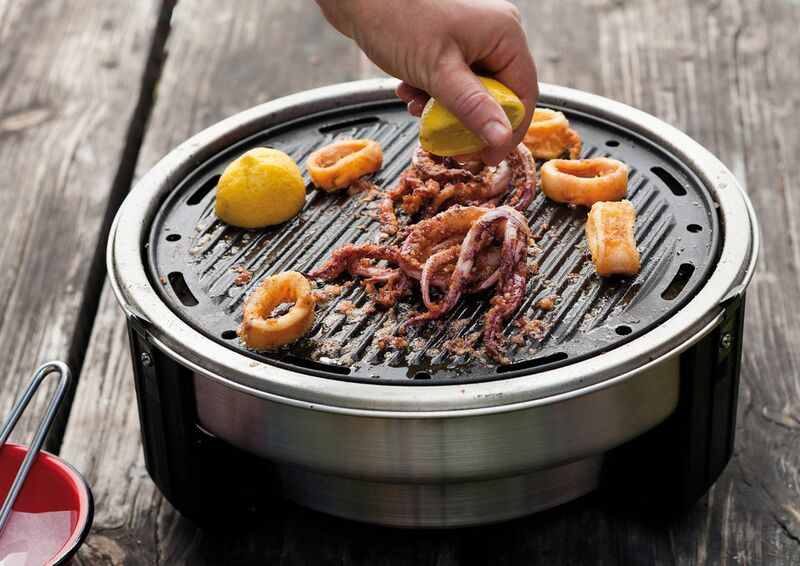 Grill the calamari over high heat, turning once until it's opaque in color, 1 to 2 minutes per side at most. Remove the squid from the grill and serve immediately with plenty of freshly squeezed lemon juice.